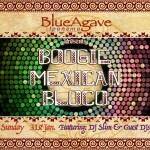 Sunday’s Rio Nightlife Pick – Locals, travelers and the expat community will come together to celebrate at the Boogie Mexican Bloco, featuring funk and soul sounds from DJ Slim and guest DJs. The unofficial bloco will be returning to the Blue Agave Mexican bar and restaurant in Ipanema, just around the corner from Posto 9 on Vinicus de Moraes 68, starting at 5PM. Some may remember the “gringo bloco” was a Carnival staple for a few years before the fuzz started cracking down on unlicensed street parties, but this year the Blue is bringing it back. There are over sixty official blocos happening in Rio de Janeiro today, but following below is a list of some of the largest. An estimated 40,000 people are getting together to parade down Avenida Atlântica, starting at Altura Do Posto 6. Over 30,000 people are estimated to be getting together to parade down Rua Jardim Botânico, finishing at Praça Santos Dumont. The largest bloco in Rio expects over 400,000 people to be getting together to parade down Rua Primeiro De Março. Over 35,000 people are estimated to be parading on Avenida Lúcio Costa, finishing at Praça São Perpétuo. With 30,000 people estimated to be gathering at Posto 9 on Ipanema Beach, this will run the latest of the big blocos in Zona Sul (South Zone). * For a complete list of all Rio Carnival 2016 blocos, see the wikirio page. Tonight the weekly Jazz no Morro event returns to Gilda in Cantagalo with Guga Pellicciotti performing the best of jazz live. 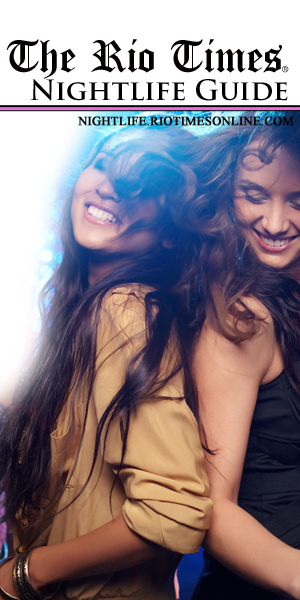 Additionally during the night, DJs will spin the best of Brazilian music, pop, and classic rock during show intervals. The Sundae Tracks party returns to Casa da Matriz tonight for its final edition. Dandara, Hill Valleys, SlimBox16, Carbona, CineDisco, Phone Trio and 2lips will perform live and DJ Melvin will spin on the first floor. Additionally during the night DJs Sal and Fel will spin on the second floor as part of the VIDEOGAME party. Tonight Sette Leblon will host a new edition of the Sette Zouk party. During the night, Arkkanjo, Thiagão, and Paloma will deliver the best of Zouk upstaris while DJ Floro spins the best of salsa and reggaeton downstairs. Promotions will include two-for-one specials on beer and caipirinhas until 11PM. The Soda party returns to Fosfobox in Copacabana tonight with the best of pop and house.DJs Fernanda Fox, Paullo Goes, and Marcelo Haubrich will spin the best of single and hits on Stage A while DJs Rick Castro, Felipe Vian, and Aramis D’Avila spin the best of b-sides on Stage B during the night. Promotions will include two-for-one specials on Screwdrivers for R$20 and specials on #DrinkSoda (a drink with rum, soda, and mojito syrup) for R$10 each. The Arpex Party returns to Barzin Bar and Restaurant in Ipanema tonight with DJ Daniel Faria spinning funk, house, hip hop and reggaeton and saxophonist Marcelo Cebukin performing live. Additionally, caipivodkas will be free until 12AM. It’s time once again for the best of house, electro, and pop as the twelve-hour Duo party returns to Gávea’s chic 00 (Zero Zero) club. DJs will start the party tonight by spinning on the deck beginning at 5PM. Then beginning at 12AM, more DJs will follow, spinning inside on the dancefloor until 5AM Monday morning. 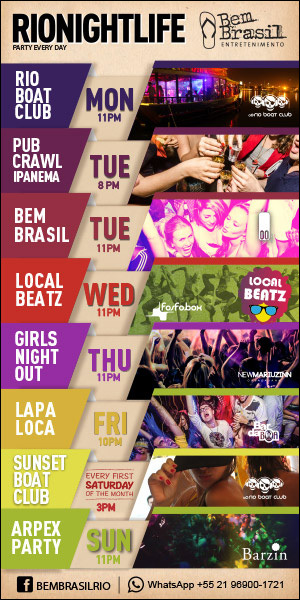 Sundays are all about samba and soccer at Lapa’s Leviano bar. Every week beginning at 5PM the venue plays live games on their screens with samba dancers following the matches and the group Samba Di Buteco playing classics of the genre, including works by Arlindo Cruz, Zeca Pagodinho and João Nogueira, among others. Additionally, DJ Mukato will spin during show intervals. It’s time to dance as singer-songwriter Rogê returns to Lapa’s Carioca de Gema to perform his own lively compositions as well as covers of works by Jorge, Jorge Benjor, and Djavan, among others. If you have never been to Bar Urca on a Sunday afternoon to drink beers and eat salgados while watching the sunset, you are missing a big part of what it means to be a Carioca. This simple establishment on the bayside has been a hit since 1939. 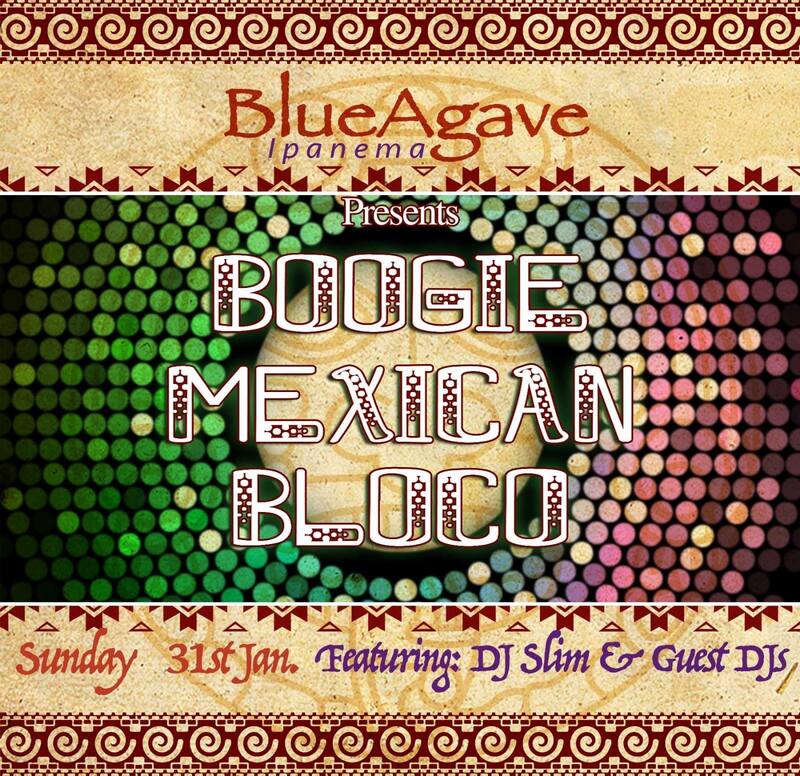 The Blue Agave in Ipanema will be hosting an unofficial bloco starting at 5PM then letting the party continue as long as the night lasts. With classic pub games like darts and pool, Ipanema’s Shenanigan’s is always a great spot to visit. Every Sunday, promotions include two for one Sol beer, caipirinha and caipivodka. Pizza Pub is also only R$10.